Contact the Borough offices using the form below or call 717-902-0706. To get started, please select the type of problem you would like to report. Use this form to submit a problem. 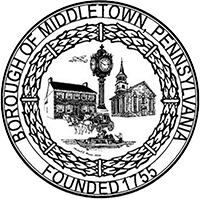 I hereby affirm that the information contained in this Codes Complaint is true and correct to the best of my knowledge and is being provided with the intent that the representations in it may be relied upon by the Borough of Middletown in connection with potential enforcement actions or in the performance of other official governmental functions. This written Codes Complaint is intended to be made subject to the penalties of 18 Pa. C.S. § 4904 relating to unsworn falsification to authorities. All complaints must be signed and must contain the name of complainant. Anonymous complaints will not be investigated. Names of complainants will not be made public; however, please be aware should the complaint result in enforcement proceedings in District or Dauphin County court, the Borough cannot protect the complainant's anonymity. Use this form to report a problem or request a service.